Mocha has just launched three bright new kitchen and table accessories. Fun as well as useful, each of them has a slightly unusual twist. 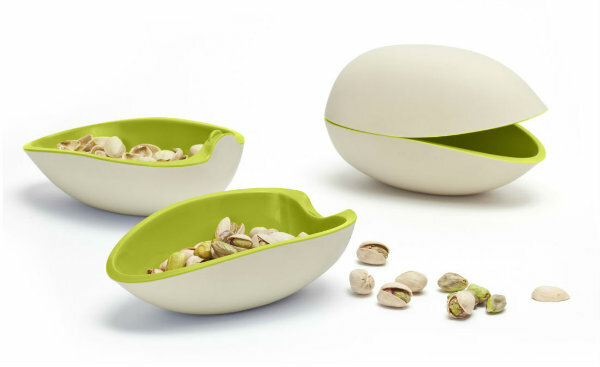 Pistachio Serving Bowls are an ideal way to serve nuts, olives, sweets and seeds. To use, simply split the pistachio in two by taking the top off. There is then a bowl for snacks and an empty one to receive discarded pits, shells or wrappers. 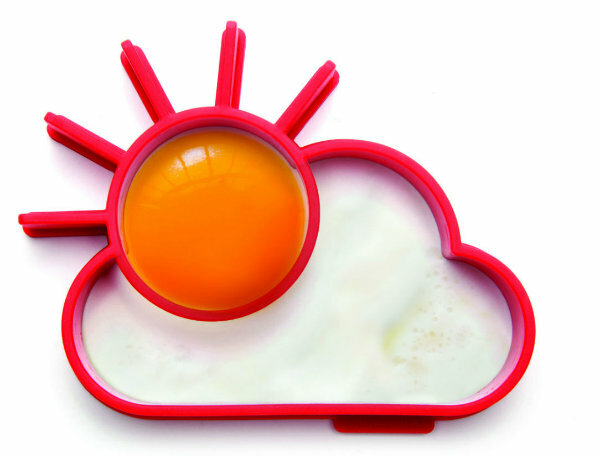 Sunnyside Egg Mould is an egg ring that makes a fried egg look like a cloud with the sun shining through. Quick an easy to use. The mould is simply placed into a hot pan and the egg poured into the circular section. Because of its innovative design, the yolk remains in the circle section to cook in the shape of the sun. While the egg flows out to fill the rest of the ring. And as it fries, turns into the shape of a fluffy white cloud. 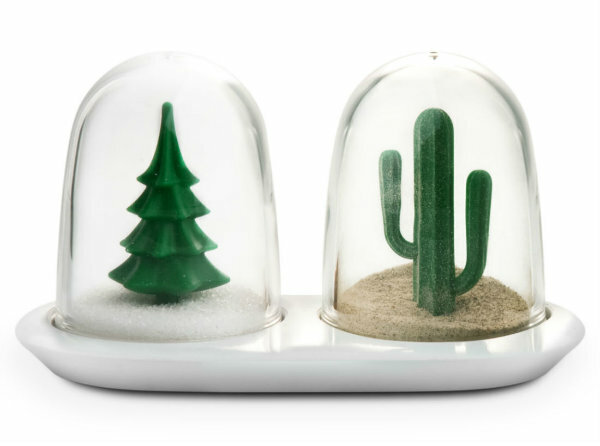 Winter and Summer Salt and Pepper Shakers are designed to look like snow globes, with each shaker representing a season. Salt glistens on the ground like snow beneath a wintery fir tree. While the spicy pepper forms sand dunes beneath a cactus in the searing heat of the desert. Mocha has just launched three new desk accessories. As well as being fun and colourful, they are also extremely useful. And they are sure to brighten up a workspace and raise a smile. Rainbow Highlighters are a set of four curved highlighter pens that are shaped to look like a rainbow. 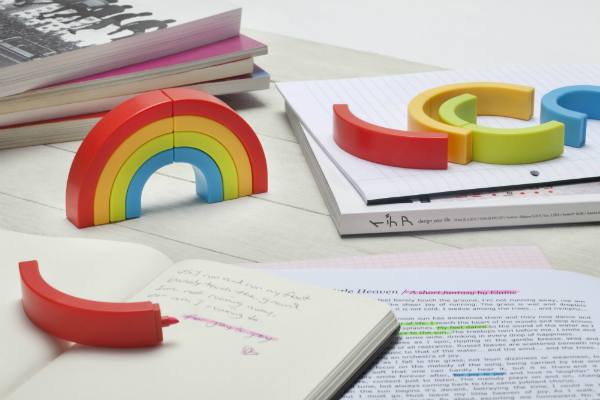 They will highlight your notes – and add some bright colour to the workspace too.they can also be stacked in different combinations to create interesting shapes. This set of four highlighter pens comes as a set of four in blue, green and yellow, and they have chiselled tips for more precise highlighting. Telly Note Holder stores memos while displaying reminders on the small screen. 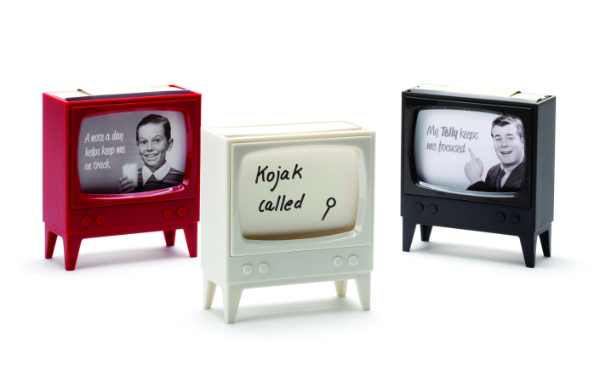 Designed to look like a retro TV, the note holder comes with 210 blank memos included. Available in vibrant red, Telly also makes for a funky decor accessory for the desk. 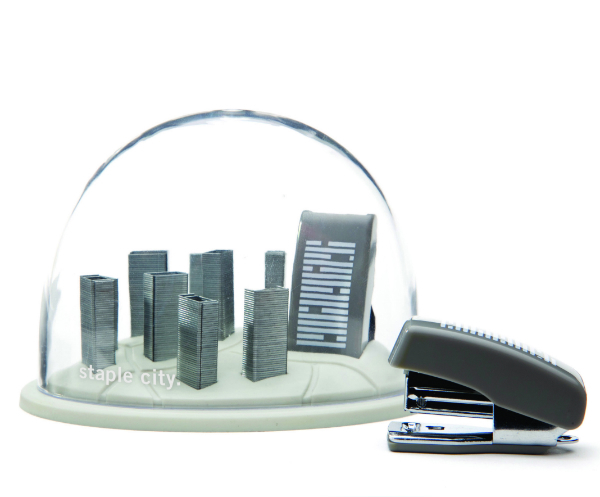 At first glance Staple City looks like an architectural cityscape captured in a snow globe. But it is in fact a clever storage solution for a stapler and staples. Perfect for lovers of design and architecture. It adds beauty to a workspace while keeping refills handy and organised. Staple City comes with the staples and compact stapler included.